An interesting and entertaining movie about family life in the south during the time of segregation, sharecropping, and World War II. This s a good and powerful movie about life in the south, when segregation was at its peak. We follow two families on a farm, the white family that owns it, and the black family that works it. They are payed to work the farm, but have to rent the supplies to do so, and of course it’s the white owners who set the prices and make the demands, without any negotiations. Throughout the movie, we get to know the people in each family. Specifically the adults who are trying to find their way in the world. Ronsel, the oldest sibling in the black family, and Jamie, the younger brother in the white family, go off to fight in World War II and experience a different world. We stay with the families on the farm during this time, watching them deal with injury, sickness, and hardship, while also jumping across continents for a little peak at what’s going on with our characters at war overseas. And when they return home, they find that things haven’t changed for the better. Racism and tension between whites and blacks is at an all time high, and the way this conflicts with what these men experiences over in Europe causes a great deal of trouble. The movie tells an interesting story, complete with poetic voice-overs and great nature shots. It does move a little slow at times, but for the most part, it’s a pretty good film. 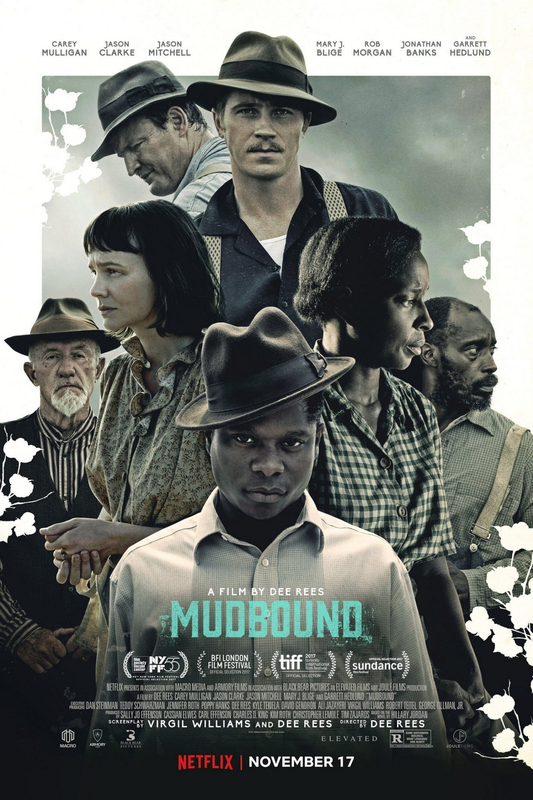 Mudbound is the story of two families living side by side, in the deep South during the time of sharecroppers. Slavery was long gone, but civil rights and actual equality was nowhere in sight. This was the time when there were rules in place to keep black people down, such as having a colored section on the bus, in the back, where all the black people had to sit. Another one was that black people could only enter and exit a store through the back door. In Mudbound, we get to see these examples. Black people weren’t even supposed to ride in the front seat of a car next to a white person. 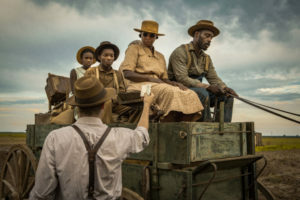 And the movie tells the story not just of a black family living through this situation, but of the white family that hired them to farm the land. The way sharecropping worked was people who didn’t have any land of their own would pay the land owner to work on the land. Then the land owner would pay the sharecroppers for the job that was being done. If the sharecroppers needed to borrow anything, like tools or a mule, from the landowner, he needed to rent it. And if the white owner (not slave owner, but land owner, or boss,) needed anything from the sharecropper, the sharecropper really didn’t have much of a choice, if he wanted to stay on and continue working the land. There were no employment rights back then. It was a “do what the boss wants or else,” kind of situation. At the start of the movie we see two brothers burying their father. The brothers are Jamie and Henry. Jamie(played by Garrett Hedlund from Tron: Legacy, ) is the younger, more wild one. He’s also the kinder of the two. Henry, (played by Jason Clarke,) is the no nonsense, serious, tough, and mean older brother. They stop a family of black people who are riding in a wagon nearby and ask for help in burying the man. Later on in the movie, we will learn the truth of what this scene was all about, and the events that led up to it. Many movies feature a clip of a scene at the start and then show it in full at the end of the movie, from A Perfect World to Carlito’s Way. It happens all the time. But in this movie we don’t realize it’s happening until the end. That means when we scene at the start of the film, it feels like a full scene. And when we see it at the end, it’s not so much watching the scene in it’s entirety, (we feel like we already did get that,) but it’s watching it in a new way, with new insight into what brought the characters to this point. After that opening, we start hearing voice-overs from the main characters in the story, about their lives. We hear about six voice-overs, which is an extremely large amount, and yet the movie never loses or confuses us as far as our understanding of who is speaking. The six characters we hear from are the two parents of the black family, Florence (Mary J Blige,) and Hap, as well as their oldest son, Ronsel (Jason Mitchell, from Straight Outta Compton.) Then we also hear from three characters from the white family. We hear the voice-overs of the two brothers, Jamie and Henry, as well as that of Henry’s wife, Laura, (Carey Mulligan.) The voice-overs show reflections and points of view about the situations. They are often poetic, as if out of a Terrence Malick movie, but this movie offers so much more, (whereas with his movies, the voice-overs are often the best part.) His movies are a simple combination of voice-overs and shots of nature. With Mudbound, there is also a pretty intense plot. Henry made a deal to buy a house from a man, and shook on it. Three weeks later, he was ready to move in. Only when he and his family got to the house he bought, they got a terrible surprise. There was another family living in the house, who were sold the property as well. The man who sold it, took Henry’s money, then sold it to this other man, and skipped town. Now Henry has his family out there, including a number of daughters, and decides that they are going to stay anyway. They might not be able to stay in the house, but there’s an old farmhouse out on the land that they can stay in, and work the land. And that’s exactly what they do. There is a house of black people, (The family with Florence, Hap, And Ronsel, as well as a number of other kids,) on the land and Henry considers that these people pretty much work for him. I’m not sure how it is that they were able to stay on the land that was owned by someone else, without being kicked off, but in a couple of scenes in the second half, we see the house owner spending time with them (first in the general store,) and come to realize that he’s fine with it. A scene of him going out there and ironing things out with them, with Henry saying something like, “look, we both know I can sue for a part of your house, but I won’t do that if you let us stay here,” would have gone a long way. But even without it, we can kind of figure things out, and keep moving on. World War II happens and two of the boys sign up to fight. There’s Ronsel, from the black family, who becomes a tank driver. Then there’s Jamie, from the white family, who becomes an airplane pilot. These are the two more innocent, dreamer characters of the bunch, and they actually have a lot in common. When they return home, later on in the movie, they become friends and share war stories. But first we get to see them in action, and both paths are surrounded by death on the field. In the case of Jamie, he is flying a plane one day with a bunch of copilots, and every one of those other men, who are sitting in the plane with him, get shot and killed. Still, he loves the job where he is flying above the world, not getting near a face to face kill, where he has to do it himself. Ronsel also loves being out there, in the military. What he loves best of all is that the people in European countries treat him like an equal. In fact, the women in particular, love him. He starts up a relationship in Belgium and ends up staying with this woman until the war is over, (instead of sleeping with the other men, in the barracks.) You might expect some resentment from the other men here, that this black man thinks he’s too good to sleep in the same place as them, or just that they are jealous, but none of that comes into play. This movie is determined to make the military a sort of escape for the two boys from these families. Their life on the farm is the hell that they are running away from. And then the boys return home and realize that nothing has changed. Hap gets injured and finds that his job is threatened because of it. He runs the risk of not getting the seeds planted in time, and so he has to pay to rent a mule from Henry. The seed is being planted for Henry. You would think that Henry would just lend him the mule, instead of making Hap pay to use it, and Laura even brings this point up to Henry, but it falls on deaf ears. Like Jamie, Laura is caring and kind, and when Hap gets injured, she takes the money that Henry keeps in the house and uses it to pay for a doctor to come out and see Hap. This family living on their farm, working for them, is good to them, after all. The mother, Florence, is the nanny who stays in the house with the white children and cares for them. Her voice over explains how her mother used to do the same thing, and now she understands why. Mudbound does build up to a climax where everything kind of comes together, including the character of Ronsel. First he has a run in with some of the racist white folks, (such as Henry and Jamie’s father, played by the terrific Jonathan Banks,) in the general store. Then there’s the letter he gets from the European woman he was with. And then things get worse. This seems like the natural progression of where things might end up, with Ronsel coming home from being overseas and wanting this place to be more like the countries he was in, with respect to the treatment of black people. It’s not, and Ronsel doesn’t willingly accept that, the same way that his parents do. The movie is really interesting at times, but at other times, it can be a little too slow. Characters like the one played by Banks might be the villains, but they give the movie some icolor and energy, and there isn’t quite enough of that. Still, it’s a good movie, beautifully shot, and pretty powerful in its ideas. Mary J Blige has been Oscar nominated for playing Florence, and I’m not quite sure what she has done that’s different from any of the other actors here, (other than, maybe a great voice-over,) but it’s nice that this Netflix movie is getting that kind of appreciation. There will be more in the future, and this movie will always be the first one, that paved the path.